The Heater Trend Sports Softball Pitching Machine and Xtender 24 Home Batting Cage combo is a functional and effective way to practice hitting softballs in the privacy of your own backyard. Both products are easy to assemble and simple to use. After assembling the Xtender 24 Home Batting Cage, simply attach the Softball Pitching Machine to the provided harness, plug in the machine and begin practice. 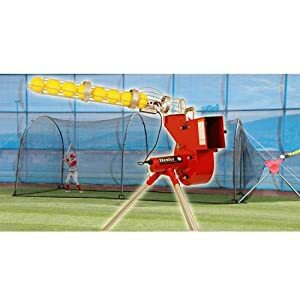 The Heater softball pitching machine features an automatic ball feeder that can deliver softballs up to an impressive 50 miles per hour. The tilt-design allows you to practice pop-ups, line drives and grounders. The Xtender 24 Home Batting Cage frame is durable and includes foam padding to protect it from powerful blows. It can also be combined with other Xtender Home Batting Cages. Combine these combine these effective tools for the ultimate at home batting experience.